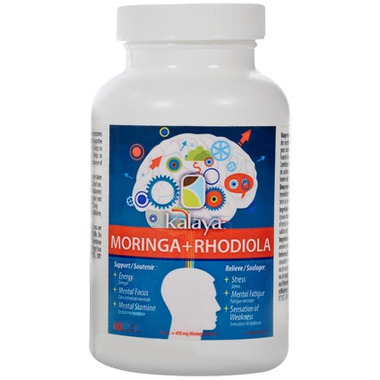 Kalaya Naturals Moringa & Rhodiola Supplement is the first and only supplement of its kind to blend two of Mother Nature's super ingredients—Moringa Oleifera and Rhodiola Rosea—to provide proven and celebrated benefits, including stress relief, supporting cognitive function and mental stamina and focus. It provides over 90 vitamins and nutrients per serving (vitamin C & A, calcium, protein, and potassium) all in one super capsule brought to you by the Canadian Medical Professionals from Kalaya. Moringa Oleifera: This tree, grown in the Himalayas of India, is referred to as "The Tree of Life" for its 100% natural properties, making it Mother Nature's ultimate super food. Celebrity TV Doctors have touted Moringa as the ultimate natural, non-stimulant energy booster to help start your day and re-energize your life. Moringa leaves have more than 3x the iron than spinach, and over 90 different essential vitamins and minerals. A serving of Moringa Oleifera contains 7x the amount of vitamin C than oranges, 4x the amount of calcium in milk, 4x the amount of vitamin A than carrots, 2x the amount of protein than milk and 3x the amount of potassium than bananas. Rhodiola Rosea Root Extract: has been shown to help relieve symptoms of mental fatigue, stress, and sensations of weakness, while at the same time helping to support your cognitive function, mental focus and mental stamina. Medicinal Ingredients: Vitamin B12 (cyanocobalamin) 50mcg, Moringa (leaf) 4:1 extract (Moringa Oleifera) 100mg, Roseroot Root Standardized Extract (Rhodiola Rosea) (1% Rosavin/3% Salidroside) 75mg. CAUTIONS: Consult a healthcare provider prior to use if you are pregnant or breastfeeding, taking HRT medication or birth control pills. Do not use if you have bipolar, or bipolar spectrum disorder. Discontinue use if you experience irritability or insomnia, or are allergic/hypersensitive to this product. date if this feeling of wellbeing continues..I'm very happy that I ordered it.